This spring, Umbrella Bagger announces a special promotion to make it easier and more affordable than ever to retrofit facilities with state of the art wet umbrella bag stands. All online orders now qualify for a 100% Price Match Guarantee, ensuring customers never pay more for umbrella stands, cans, and automatic wrappers. In addition to a low price guarantee, Umbrella Bagger also offers free shipping for all orders placed online. Umbrella Bagger showcases a highly specialized line of umbrella safety and storage equipment, ranging from simplistic stands to more advanced automatic wrappers. Price Match and Free Shipping specials apply to all products, promoting awareness for the equipment available to prevent rain-related liquid accumulation and injury. 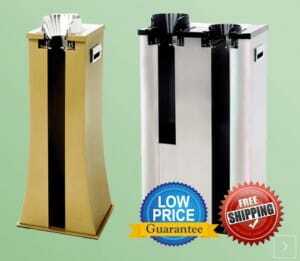 On the simplistic side, a basic line of umbrella stands, cans, and racks are available in 3 beautiful finishes. These products are available in a variety of sizes, with storage capacity ranging from 4 to 30 wet umbrellas. For commercial locations that want to wow prospective customers and guests, new Automatic Umbrella Wrappers are also available. Automatic Wrappers feature a special mechanism that effortlessly envelops wet umbrellas in a disposable bag, giving guests a fast and convenient way to insert, wrap, and carry-away their umbrellas. These units are often seen as a superior means of moisture control and accident prevention because they effectively control rainwater runoff without asking patrons to relinquish control of their umbrella or leave it at the entryway. To learn more, readers are invited to call Umbrella Bagger Client Services at 1-855-328-8100.